I was very happy to get a call from Matt Reed not long after the last Fylde CIC meet to ask if I fancied another trip to the Ben as there were some free places in the hut. The conditions were said to be very good and there seemed to be a good chance of getting on one of the grade V classic routes. Matt was happy to drive and picked me up in Keswick. My usual ice climbing partners have either retired from Scottish ice climbing or been caught up by advancing age, not helped in the case of Phil Newton of Keswick MRT who sustained bilateral compound tibial fractures caused by a fall while soloing ice in the Haweswater area of the Lakes. From what I had seen of Matt on the previous ice meet he seemed to be a steady climber, keen to up the grades a bit and not as likely to fall off seconding as happened to my partner on Zero Gully when I led it in 1999—not a good thing to do on a route which often has less than brilliant belays. The trek up to the hut with a huge rucksack was as testing as ever, but clear skies and a good forecast took our minds off the slog to a degree. We were very surprised to find that the hut was only ¾ full but it was actually rather pleasant to have some space for a change. 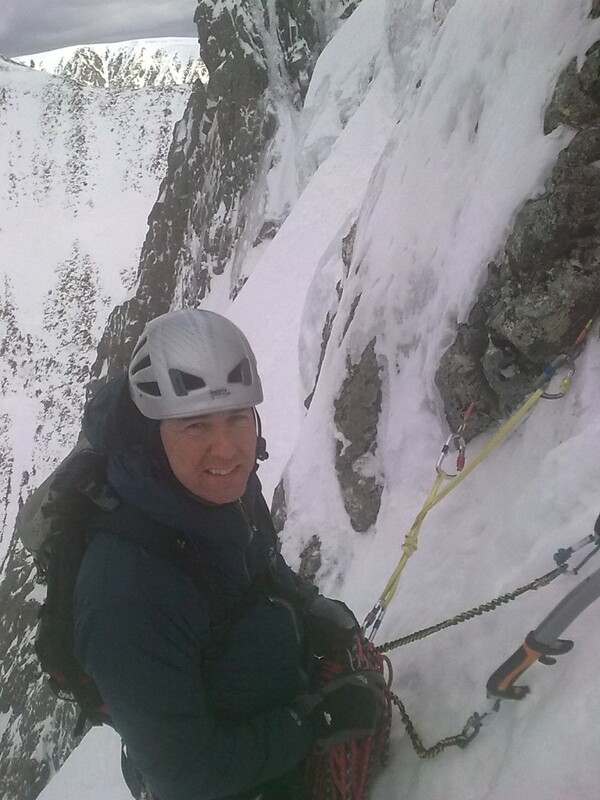 Matt wanted to start leading some steeper ice so I suggested starting off with Green Gully 180m IV 3 ***. The route as ever was very atmospheric with decent belays and Matt led a pitch after getting into the swing. The rest of the route went without incident and let us get used to climbing as a team. The forecast for the next two days looked good and so the following morning we got up sharpish and headed off to Point Five 325m V, 5 ****. It was in terrific nick with fat ice and solid placements, blue skies and very exciting climbing as usual. The crux on this occasion was the Chimney pitch, and as the Rogue pitch looked pretty reasonable for a change with lots of good ice for screw placements I suggested that Matt might want to lead it, which he did in good style. The ice was much thicker than in 1984 when I first climbed the route. The Rogue pitch was thin on that occasion and was protected by one peg near the start of it, there being no chance of placing a Snarg in the ice as it was too thin. I had broken the tip of my Curver axe, a common problem with that make and type of axe, at the start of the route and had an epic on the crux with a chance of a long fall. There were no dramas on this ascent and the cornice wasn’t a problem. While I was on Zero in 1999 the cornice broke on Point five and swept two climbers of the route .It felt great to pull over the top after such a fantastic climb and the views on the top of the Ben were outstanding, the best for me in 30yrs of climbing on the Ben.We lingered for a long time on the summit, taking in views of the Western Isles and surrounding snow covered mountains under a blue almost Alpine sky. Back down at the CIC hut we had a great carb rich meal and talked over route possibilities with SMC members and others. I applied to join the SMC in the early 90’s and thought I might have a good chance. Mal Duff and Andy Nisbet proposed me and I had climbed a fair bit in Scotland but was turned down as I hadn’t done enough in the five years of so preceding the application apparently. (Had moved to England as a Gp ,80-90 hrs per week and had two children so no spare time!!) Damn!! Not that I bear a grudge or anything!! Matt was in some pain due to musculoskeletal problems and although we chose Zero Gully as our next route it was by no means certain that he would be able to climb. Anyway we set off hopefully although Matt had to take pain relief and it was clearly touch and go still. The route looked to be in fantastic condition so fingers and toes were well and truly crossed and it was only when we were not far from the foot of the route that Matt said he would give it a go. A brave decision as clearly the pain was a problem. Some young looking folk were racing to get to the start before us so we bust a gut to hold them off apart from one who got passed and set off to solo it, shouting down to the effect that we shouldn’t worry about him dropping off onto us as the ice was solid! A chap intending to start by us and then do the Slav route did his best to gear up quickly and get ahead of us but we got moving first fortunately with two other teams following him to the bottom of the route. In 1999 I found the first pitch up the icy grooves to “a poor belay below a steep wall” to be the crux and my arms were pretty tired about half way up it, not having been helped by bashing in two Snargs while hanging onto the other axe. However due to thicker ice and modern ice screws I managed to get four in during this ascent then set up a hanging belay from the resident sling and two ice screws. Matt climbed confidently to the belay and I traversed right into the Gully. I found this to be the crux pitch, the traverse being rather precarious. Once again I set up a very sound ice screw belay, glad to have the easier climbing to look forward to. An SMC member told me about two very experienced climbers having fallen a few years ago while moving together on easier ground nearer the top and having both died as a result. We finished our 1999 ascent in the dark but still pitched it with ice axe belays only, there being nothing better and no runner placements. We pitched it again this time but found the odd rock, peg or sling placement and had solid main belays. We pulled over the top to glorious views again and a photo session and even had the luxury of a bit of summit cake from Smiler Cuthbertson who had just finished the Orion face with a client! He told us he had fashioned a snow stake to protect certain areas of risk on the route-nice idea if you have the skill and can fit it in the sac! I due course we headed back down to the hut and then down to the car as Matt had to get back and wasn’t concerned about very generously driving a long way at night after such a full day. What a great trip!